It’s here. The festive period. You can tell everywhere you look: Christmas is coming. Twinkling trinkets line the streets of the city centre, lighting the way of weary shoppers and workers heading home for some well-earned succour, the lingering sound of Christmas songs and bells still ringing in their ears. The countdown to the big day is here, but it doesn’t matter what your beliefs are, everyone is invited to revel in the spirit of the season and enjoy the warm glow, the whisper of gifts and good cheer. And as thoughts of the coming festive period begin to form and plans are made for the special days ahead, I want to return to a Christmas of the past and one that is closest to my heart. We only have a certain number of these special occasions in our lives, which is why they are so precious. I remember the last Christmas my sisters and I spent together with our mother before she died. She had been sick for a few months and we wanted to treat her, and all of us, with a trip away. So we took her to Prague for three nights over Christmas, arriving on Christmas Eve and leaving the day after St Stephen’s Day. We didn’t know then that it was to be her last Christmas. She was weaker then following months of chemotherapy and radiation, and the walking stick she used to help her stay upright was light brown and carried her lightened frame easily. Because of the steroids she was taking to reduce the size of the tumour in her brain, her face was swollen around the cheeks, which gave her a childlike cherubic look, and pandered to our earnest attempts at mothering her — which she hated. And although she was not the woman we knew her to be, she was every bit the mother we adored. My memory is poor at the best of times, and my sisters will pick apart my account of the days we spent in Prague, but one thing we can agree on is the love that we all felt and the joy we had at being so far from home and doing something so different for this wonderful time of the year; to forget for just a few days the awful truth hanging over all of us that we could one day soon lose her. The days we spent in Prague were beautiful, and not without the normal family banter and bickering, but it was simply one family being its usual crazy self. Prague was spectacular. We couldn’t have visited a more serene and beautiful place. I remember my mother’s face when we visited St Vitus Cathedral, and the wonder on her face at the magnificence of such a building. Throughout our trip, the look in our mother’s eyes was of a woman who wanted to absorb as much of life as possible, to take in new experiences with a relish and appetite that only people who know they have little time left can experience. She was tired, weak and facing an uncertain, frightening future, but the old cobbled streets, the beauty of the city, a freezing wind blowing through us and the hot drinks that warmed our bones, lifted her up and brought something new to her life, taking her away from her troubles and her loving, albeit, infuriating daughters. I only hope it gave her something to hold on to through later tougher times. 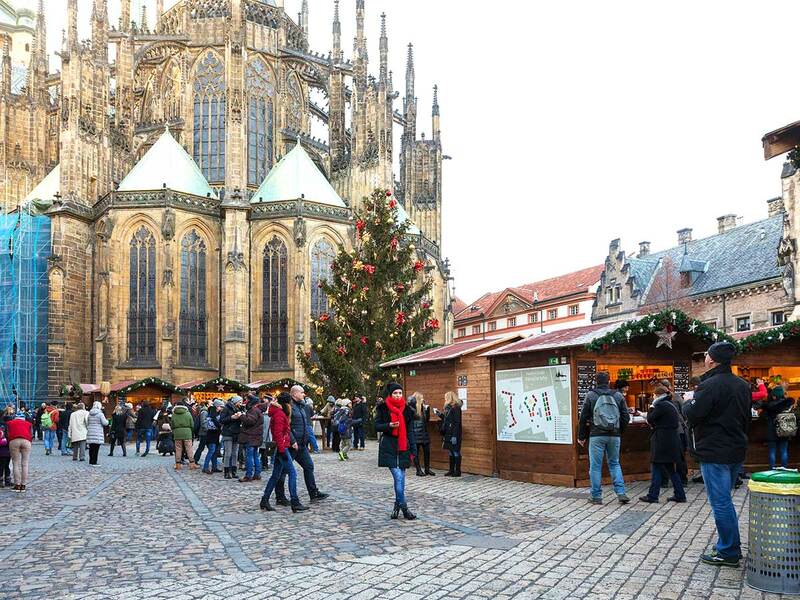 I’ve been to Prague since and for me, it will always be associated with my mother and the Christmas we spent there together as a family. One day I hope to go again. Christina Curran is freelance journalist based in Northern Ireland.